A stunning innovation in hand held lighting power, this flashlight has a super bright daylight white front light with incredible power zoom lens control, & a blindingly bright cob style floodlight lantern on the side. This innovation in LED efficiency results in a light beam that cuts through the darkness like no ordinary torch, it is blindly bright and the zoom function allows for long throw projection of the beam. The cob light on the side is a super bright LED flood light that can illuminate an entire room and makes an ideal task light for hands free working of any kind anywhere. It comes with a beautifully crafted designer aluminium body for heavy duty, durable performance & even has a strong magnetic base to allow convenient hands free lighting, simply pull the zoom head to widen or narrow the light beam. This is a true powerhouse of a torch that is the ideal companion for any investigator. Warning! Never Look Directly Into the LED Light Source at Close Range, Please note that only one light function can be illuminated at a time. COB (Chip on Board) LED is a recent development in LED technology using chips with multiple diodes. 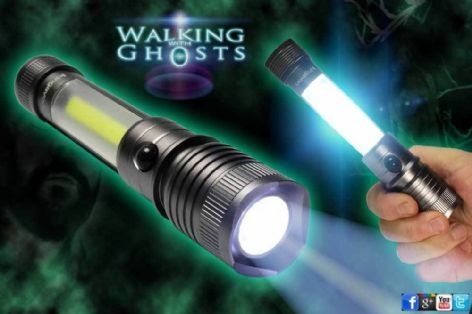 We have selected this particular flashlight as they require only easy to find AAA batteries, unlike many others on the market that use hard to find expensive Ultrafire style batteries.